At Thrive Decor Fine Home Furnishings, furniture from the 18th Century to Art Deco lighting to modern art reside side by side. Esada's talent is obvious; the result is stunning. "A room with all antiques is a room with no future," said Esada. "A room with no antiques is a room with no soul." That is why the designer's format is a mix of important modern art and antiques. "It's all about contrast, texture, color, age, style. It's the bouncing all over the place that makes it fun." It also makes it interesting. "Young people have walked into the shop and said 'I've never thought of antiques like this,'" he said. Or maybe it's just that Esada's enthusiasm is contagious. People in my business are sometimes known for their cussing and whining, but I've always been a source of positivity," he enthuses. Esada indulges his passion for art in the north portion of his showroom, which will double as an art gallery. He plans to host several exhibits a year, beginning with "Penny's from Heaven" featuring works by his husband, artist Dave Wilcox. The show opens on Fri., June 24 at 7 p.m.
"I feel like I've found my home," said Esada. "The clientele have been great, and I've made fast friends with the neighbors," among them dress designer Diane Merrick who has a nearby shop. "There's Kokomo for great coffee, the only wallpaper shop in the city is right across the street, and Shaky Alibi has amazing waffles. Thrive Decor Fine Home Furnishings is dedicated to providing you with a level of service that is unmatched. Our attention to detail and eye for design ensures an enjoyable in store and interior design experience. Free appraisals are available from 11-4 every Monday at Thrive Decor Fine Home Furnishings. 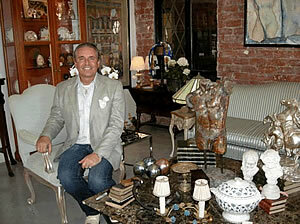 OWNER Randy Esada mixes modern art with antique and fine furniture at his shop at 7407 Beverly Blvd, Los Angeles, CA 90036.